Thanks very much for your excellent information to all the questions of our Members on Pithrus /Sraddham . I found your responses very illuminating . I hered in upanyasams that the above order is shrushti kramam and the pralaya kramam is just the reverse order of the above. By which Emperuman can swallow all the universe when it is converted in the form of Aakasam which means space. The possiblity of this can be compared with the computer data : Very huge valume of books can be written in a CD disk with the human who is Alpajgan (with little knowledge) So, it is possible by the Sarvajgan (Total knowledge). From these evidence, we can justify onething that anything can be converted to anything. 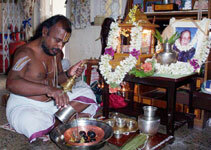 So, the food and theertham offered in the shradham can be converted to form by which the pithrus can be satisfied. The possiblity of this can be compared with our day to day affairs: Our Son or daughter who is residing in a remote place (some thousand kilometers away) call us over phone and asking " What Mammi / Dadi did you take your lunch? How are you? " and some other Kushalams.. We can realize that everybody will well satisfy with those kushalams than giving him a pound of gold. So, these is what expected or product of a shradham (assemption). When it is made out as a compulsory Karma by shastram, it required some procedures and shastram includes some more benefits from that karma. and many other pithrus are getting benefits by putting the vikiram by saying: " Asamskrutha prameethaye thyaginyoya: kulasthriya: dhasyaami thebhya: vikiramannam thabhyashcha paithrukam " menas some pithrus who ever gone without propper samskaram / karma can be benifitted. then while leaving the Vaayasa pindam : " ye agni dhattha: ye anagni dhattha: ye va jaathaa: kule mama bhumau dhattena pindena| Agni dhatebhya: anagni dhatebhya: asmath kula prasuthi mrudhebhya: ayam pinda: swatha nama: "
means pithrus who gone by the samskaram with agni or without agni samskaram of my kulam can be benifitted. 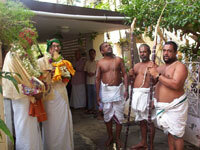 Some of kula pithrus may gone at prasavam (delivery) itself for them this pindam can be submitted. So, the son of the prapannan should do shradham for the sake of all involved in a shradham. The mumukshu atma can be left automatically from the list. This can be compared with a practicall example: A telelphone company or a bank is sending message to its clients, that " your last date to renew your so and so account is : ...... the clients who ever paid already excused and ignore this ..... "